The day after Thanksgiving wouldn't be complete without a special shopping deal. On Friday, November 25th, we'll double your money in AT&SF Bucks! Purchase 25 AT&SF Bucks, and we'll give you 25 extra. Buy 50, we'll give you 50 more! Buy 100, get 100! You get the point: whatever amount you purchase, we will send you the same amount at no cost. 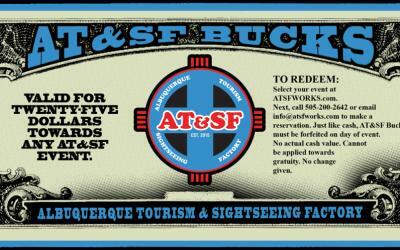 AT&SF Bucks can be used for any event offered by Albuquerque Tourism & Sightseeing Factory and make the perfect gift for everyone on your list. There is no expiration date.